The post office has "Forever" stamps that make you think you are investing for your retirement. Seems like the time is here for a "Forever" music format. Some people want Jetson flying cars and colonies on Mars. I want to buy a Layla recording that will keep updating to new technology forever guaranteed. Like Tommy Lee Jones' character, Kay, in Men In Black, I keep buying the White Album again. And Workingman's Dead and Dave Brubeck's Take Five. The US Postal Service announced Cowboys of the Silver Screen stamps for release in April, 2010. 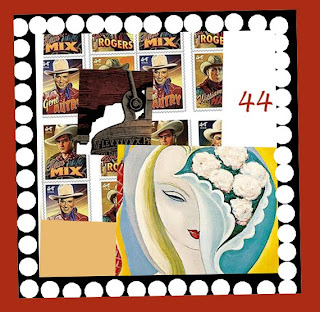 I get a kick out of the Tom Mix stamp because Mix allegedly tended bar at the Blue Belle Saloon in Guthrie, Oklahoma before his movie career. We spent a lot of time in Guthrie a couple decades ago. My sons barely remember living in Oklahoma, and rarely use snail mail. Movie cowboys were already disappearing from the silver and technicolor screens when I was in elementary school. Have movie cowboys made the many technology transitions from the Silver Screen to DVD and beyond? Becoming postage stamp idols probably won't create a new generation of fans. Forever is getting more elusive all the time. Tom Mix (1880-1940) was one of the most celebrated Western film stars of the 1920s. He wowed movie crowds and live audiences alike with his daredevil riding, expert rope handling, unerring marksmanship, and rugged good looks. He also served as a role model for a generation of schoolchildren, maintaining a wholesome screen persona that involved “no cussin’ and no drinkin’” by his characters. A legend in his own time, Mix wore oversize Stetsons, fancy suits, and handmade Texas boots with engraved silver spurs. He rode “Tony, the wonder horse,” who also became an audience favorite. The stamp art is by freelance illustrator Robert Rodriguez, whose work has been featured on more than a dozen previous stamps. Rodriguez based his portrait of Tom Mix on a likeness of the actor that appeared on the Cupid’s Round Up (1918) movie poster.